Regularly organize Conferences, Workshops and FDPs. Quarterly publish two journals with ISSN in which high quality research work in the areas of Engineering, Science, Technology, Applied Sciences, Business Management and selected areas of social sciences are publish. Updation about upcoming International/National conferences, Workshops and Faculty Development Programs (FDPs) are share among the members on every 15th and 30th of each month. Discount on publication/registration fees offered by Journals and Organizers of Conferences, Workshops and FDPs will be intimated from time to time. If a researcher want to get his/her questionnaire filled, then he/she can sent a request and the form link (please use Google form for questionnaire) to membership@iaraedu.com and we will forward the link to all the members. Members are requested to send details about any conference/workshops/FDPs to membership@iaraedu.com and we will forward the accumulated information to all the members. If a member wants to share job information of his/her organization, they can send it to membership@iaraedu.com and we will forward it to all the members. 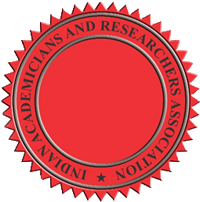 If any Researcher wants to write a paper jointly, then he/she can send the topic of the research to membership@iaraedu.com and IARA team will circulate the information among the members. If any member shows interest then we will share the e-mail ids and mobile numbers among the concerned members so that they can communicate and jointly prepare the research paper. If any scholar is looking for a guide for his/her Ph.D, then he/she can send a request to membership@iaraedu.com and we will forward the request among the interested Ph.D holders.